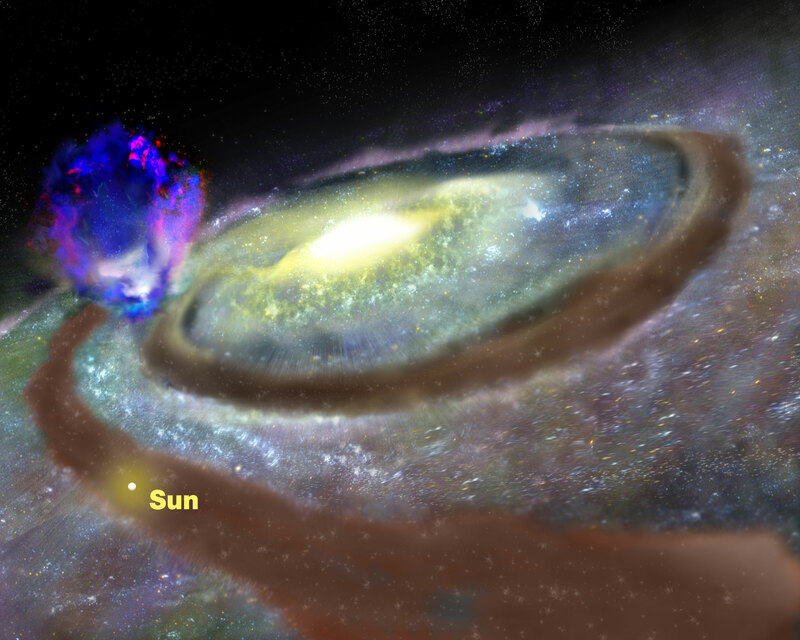 Astronomers using the National Science Foundation's Robert C. Byrd Green Bank Telescope (GBT) have discovered a huge "superbubble" of hydrogen gas rising nearly 10,000 light-years above the plane of our Milky Way Galaxy. They believe the gas may be driven by supernova explosions and the intense stellar winds from an unseen cluster of young stars in one of our Galaxy's spiral arms. "This giant gas bubble contains about a million times more mass than the Sun and the energy powering its outflow is equal to about 100 supernova explosions," said Yurii Pidopryhora, of the National Radio Astronomy Observatory (NRAO) and Ohio University. Pidopryhora, along with Jay Lockman of NRAO, and Joseph Shields of Ohio University, presented their results to the American Astronomical Society's meeting in Washington, DC. "We see that all the hydrogen gas in this region of the Galaxy is disturbed, with many smaller outflows closer to the plane of the Galaxy and then a giant plume of gas that forms a sort of cap on the whole thing," Pidopryhora said. The ionized hydrogen, with atoms violently stripped of their electrons, seems to fill the interior of the superbubble while the neutral hydrogen forms its walls and cap. The scientists speculate that the gas may be blown outward by the strong stellar winds and supernova explosions from numerous massive young stars in a cluster. "One theoretical model shows that young stars could power an outflow that matches what we see very closely," Pidopryhora said. According to that model, the superbubble probably is 10-30 million years old. "Finding this superbubble practically in our back yard is quite exciting, because these superbubbles are very important factors in how galaxies evolve," Lockman said. Superbubbles, powered by supernova explosions and young stellar winds, control the way heavy elements, produced only in the cores of stars, are distributed throughout the galaxy, the scientists said. Those heavy elements are then incorporated into the next generation of stars -- and planets -- to form. "The formation of our own Sun and planets probably was heavily influenced, if not triggered, by a nearby supernova explosion," Lockman said. The Green Bank Telescope, dedicated in 2000, is the largest fully-steerable radio telescope in the world, with more than two acres of collecting area in its giant dish. 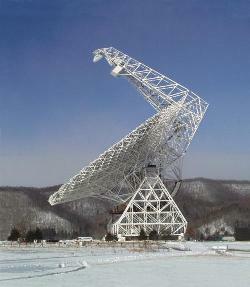 Located within the National Radio Quiet Zone in West Virginia, the GBT provides extraordinary sensitivity for observing faint radio-emitting objects in the distant Universe.